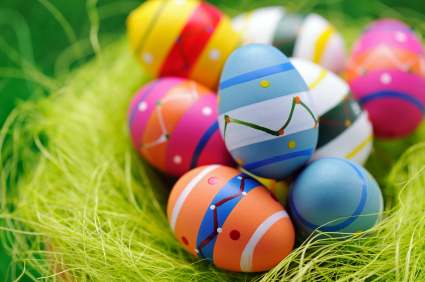 Colorful eggs are a sure sign that Easter is approaching and that the tax deadline is right around the corner, but there’s an even more important egg you should be thinking about. Your nest egg may not get much thought, especially if you are young and retirement seems like it’s decades away, but the things you do today will make or break your financial future. By doing a few small things right now you can ensure a better retirement. Don’t ignore the tax benefits of building a nest egg. A 401k and traditional IRA will give you a tax break today by allowing contributions to be considered tax deductions. You may be getting ready to file your taxes before the April 15th deadline. You can still make a contribution of up to $5,000 to your IRA ($6,000 if over 50) by the tax deadline and take a tax deduction for the contribution on your 2012 taxes. You can build your nest egg and at the same time keep more of your hard-earned money. If you opt for a Roth IRA you won’t see a tax break today, but qualified withdrawals in the future will come out tax free. If Uncle Sam is going to provide a benefit for saving money, take advantage of it. After you file your taxes and find out you’re getting a tax refund, you can contribute some of your tax refund to your IRA and get a head start on tax savings for next tax year while growing your retirement. If you have a 401k at work or you opened up an IRA these vehicles are a great start, and if you’re already contributing something, that’s all the better. The thing is, you can always do more. Chances are you aren’t maxing out your 401k so there’s room for improvement. You may be thinking that there’s simply no way you can afford to put more away, and it’s true that money is tight in this economy. But you don’t have to feel like you’re taking on another mortgage payment just to boost your retirement savings. Start small. For example, if you’re currently contributing $200 a month, bump it up to $250. 50 extra dollars a month doesn’t seem like it will help, but over the long run it can be a big difference. Just the extra 50 bucks a month over the next 25 years tucked away in your retirement account will likely add up to $30,000 or more. Whether you bump up your contributions 20 dollars a month or 200 dollars a month, the idea is to make it a habit every year. When you make a small bump to your monthly contributions your budget won’t take a noticeable hit. Sure, you might feel the pinch initially, but it doesn’t take long before your spending adjusts and you completely forget about the extra money you’re putting into your nest egg. Now, if you make the same small increase each year it won’t take long before you’re putting a lot of money away toward retirement and you don’t even realize it. You will be thanking yourself when it comes time to rely on that money. If you aren’t currently building up your nest egg with a 401k, IRA, or even just a savings account, now is a perfect time to start. Just like the advice above about starting small, that’s probably how you’ll want to start for the first time. If you can’t afford to max out an IRA right now that’s perfectly fine and nothing to be ashamed about. Start with 25 or 50 dollars a month. Sure, that alone won’t give you the retirement of your dreams, but we’re just trying to build a foundation and get into the habit of saving. Over time you will increase your contributions and it all adds up. Remember, every day that passes is one less day you have to save. You can’t get that time back, so save something, anything, and it will pay big dividends and help you save on your taxes.